It’s been too long since we’ve thrown one of our shindigs with gdgt — and we’re changing that right this second. If you can’t make it to our bash at 82Mercer in NYC tonight, you can at least follow along with our event liveblog. Samsung is on hand with its latest gadget lineup, as is Sony, with its HD gear. That’s not to mention GoGo, Nokia and Ziphius among several other brands ready to show off their wares for attendees. We’ll be sharing the highlights, from product demos to discussions with Engadget and gdgt editors, and throwing in our snapshots throughout the night. Keep your browser parked here to catch it all. 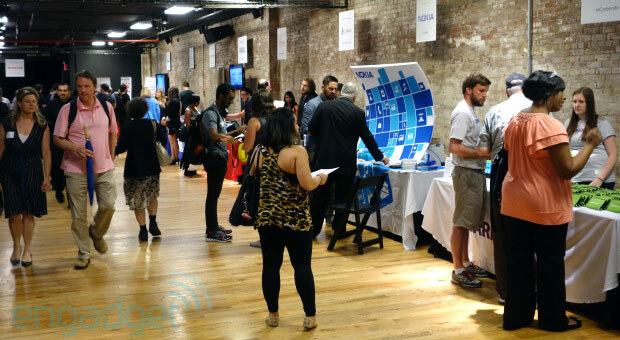 Oh, and if you’re here at the event, tweet your photos with the hashtag #engdgtNYC — we might just throw them in the liveblog! If you followed our Insert Coin: New Challengers contest at our first-ever Expand event, you may recognize this guy. The Ziphius, an WiFi-enabled aquatic drone powered by a Raspberry Pi, won $25,000 in prize money back in San Francisco, and three months later it’s taking the next big plunge: launching on Kickstarter. The bot launched its crowd-funding campaign tonight — at Engadget+ gdgt live in NYC, no less — and the Ziphius team says the $125,000 in requested money will go toward refining the device’s mold for the final-production version. As you can see from our gallery below, the package already looks sleeker, and it comes in pink along with several other new colors. Backers of all pocket sizes will be rewarded with everything from their name on the website ($1 pledge) to a Ziphius of their own ($195 and up). Click the source to check out the Kickstarter page for yourself and donate if you’re so inclined; the project has 29 days to meet that lofty funding goal. Google’s Cloud Platform holds a certain amount of appeal for developers looking to quickly build robust web apps. Of course, getting started is a bit involved. You’ll first need to download and install several tools and an SDK on your local machine. Cloud Playground offers the chance to dip your toes in the water and experiment with services like App Engine, Cloud Storage and Cloud SQL sans the lengthy installation process. The browser-based tool is designed for testing out sample code, evaluating APIs and even sharing code snippets without the hassle of building a complete development environment. This isn’t a proper solution to web-based development, however. For now you’re limited to Python 2.7 App Engine apps, and the code editor and mimic development server have a rather basic feature set. Still, for those who are tempted by Cloud Platform, but not quite ready to dive in head first, the Playground is a welcome treat. If you’ve wanted full-blown Windows 8 in bite-size form, you now have your chance: the Acer Iconia W3 is on sale in the US. The 8.1-inch slate is in stock at both Office Depot and Staples, starting at $350 for a 32GB model at both outlets. Don’t count on the 64GB version being available — it’s still listed as an online-only pre-order at Office Depot. There’s also no word on inventory at Amazon or other competing retailers. Should you not be picky about capacities or store choices, however, you can take the W3 home today. This entry was posted on June 24, 2013, 5:42 pm and is filed under Mobility. You can follow any responses to this entry through RSS 2.0. Both comments and pings are currently closed.